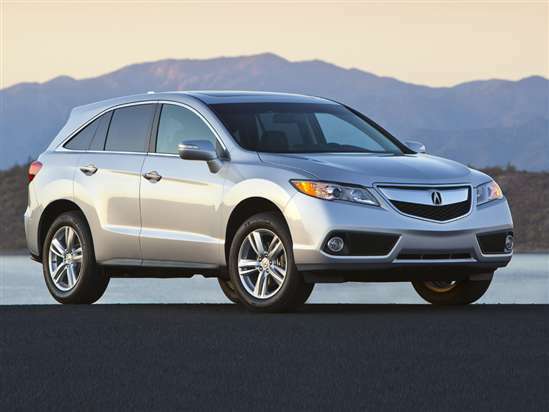 Redesigned for the 2013 model year, the Acura RDX carries over for 2014 without change except for a new Kona Coffee paint color, which replaces Amber Brownstone. The 2014 RDX is based on the same platform as the Honda CR-V, and is sold in single level of specification. Standard equipment includes leather seats, heated front seats, a 10-way power driver’s seat, dual-zone automatic climate control, a power sunroof, 18-inch aluminum wheels, and several useful safety and connectivity technologies. A power tailgate, Xenon HID headlights, a premium audio system, and more are included in the optional Technology Package. A 273-horsepower, 3.5-liter V-6 engine is standard for the RDX, and is equipped with Variable Cylinder Management (VCM) technology. The VCM system allows the engine to operate on fewer cylinders under certain driving conditions, such as when cruising on the freeway or coasting down a hill. This helps the engine to conserve fuel. A 6-speed automatic transmission is standard, and offers a manual shift mode and paddle shifters on the steering wheel to give the driver greater control over gear changes. Grade Logic Control is standard, holding a lower gear to help the RDX climb and descend hills. In combined city and highway driving, the RDX’s V-6 delivers 23 mpg with front-wheel drive and 22 mpg with the optional all-wheel-drive system. Official safety ratings for the 2014 RDX are not available as this vehicle summary is written. Last year, the RDX received the highest possible rating in frontal-impact, side-impact, rear-impact, and roof crush strength tests conducted by the Insurance Institute for Highway Safety (IIHS). Every Acura RDX is equipped with Bluetooth hands-free calling and music streaming, a USB port, SMS text messaging capability, and a passive keyless entry system with push-button starting. Option the luxury crossover with the available Technology Package, and the RDX is equipped with AcuraLink smartphone pairing and mobile services, a navigation system, a premium sound system with hard-drive music storage and Song by Voice technology, and Pandora Internet radio connectivity. This package also contains a solar-sensing climate control system that takes into consideration the position of the sun and the vehicle in order to make occupants more comfortable.